There used to be a time when faithful Catholics could depend on their Pope. The main people they had to convince of the Catholic faith were non-Christians and they knew that whatever they said, if they were in good standing, would be backed up by the pontiff in Rome. But unlike ever before, many faithful Catholics have felt somewhat abandoned by the current pope. As can be seen in this article, a Catholic writer has struggled to listen to what Pope Francis says and to abide by and do his best to follow it. But he's finding it more and more difficult every single day. Specifically he is talking about Pope Francis's recent statements about illicitly divorced and remarried Catholics. The question of whether or not they should receive communion has been made very ambiguous by the current pope. But the problem is that anytime anybody attempts to receive clarification about this very important issue, the pope responds by saying they're too caught up with the rules and that they are not being real Christians and so on. But all throughout the history of the Church great saints have asked specific questions and sought specific answers. Of course much of the time Catholic theologians have been ridiculed and mocked for entertaining very esoteric and unimportant topics and questions such as "how many angels can dance on the head of a pin?". But the question of the moral status of people in irregular marriages is not something that is abstract or that does not concern or affect anybody. Pope St. John Paul II addressed the question of Catholics who may have been immature in their faith who decided to divorce and remarry and whether or not they can receive communion. The former Pope acknowledged that these are difficult situations in many cases. For example, if a second marriage produces children and this family has been together for many years, the pope did not feel it would be a reasonable obligation to force this illicitly married couple to split up and go their separate ways. Rather, he said, that for the sake of the children the couple could remain together and live together so long as they were not in a conjugal relationship. The difference here is that when the question of continuing a conjugal relationship comes up, the pope tries to sidestep answering it and has gone so far as to state that each case is individual and even sexually active couples could receive communion in certain circumstances. Naturally, people want to know what the certain circumstances are. And we know from experience that whenever a small exception is granted to a general rule in many places Catholic churches have been known to go way overboard in implementing the exception. For instance there is a dispensation that allows a person to choose to do a charitable act instead of abstaining from meat on Friday. But most Catholics do not even believe that abstinence from meat on Friday is in any way even suggested anymore let alone required unless they do something to substitute that action. Another example is receiving communion on the tongue. 95% of Catholics receive communion in the hand and then they place it in their mouth. But even today receiving communion on the tongue is considered the norm and receiving in the hand is considered an exception yet as we can see clearly 95% of Catholics follow the exception rather than the rule. The same goes for altar girls. Alter girls were allowed as a very specific exception to the rule in one particular diocese I believe in the US. However despite the fact that they were a tiny exception in the overall grand scheme of things they have now become again the norm. Yet another example is extraordinary ministers of Holy Communion. Once again these are lay people who are given special permission in very finite and unusual circumstances to allow them to distribute communion instead of just the priest. However I would challenge anybody to find a single Church on any given Sunday where there are not a half-dozen or more lay people giving out communion. My point with these multitude of examples is to show that anytime the Church grants even the tiniest of exceptions under the most specific of circumstances. in general. because of our fallen nature. people will abuse the exception to the point where it becomes the absolute norm. So it is with these teachings that are coming from Pope Francis. There are legitimate questions about what happens when a person and the couple is legitimately married contrary to the rules of the church that we believe come from Jesus Christ himself and whether they should be accepted to receive communion which presumes they are in the state of grace. This is a serious question and Pope Francis has not only not specified and clarified, he simply tells people to look elsewhere and to ask someone else and then he usually proceeds to, in some way, insult people who are even just searching for answers. 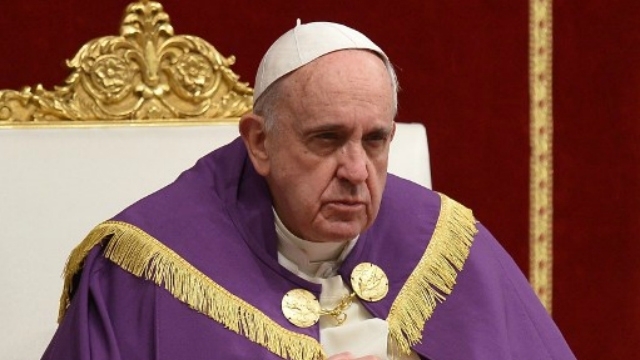 The funny part about it is that although Pope Francis is criticizing people's legalism - as he calls it - he does not hesitate to condemn in the strongest language certain pet peeves of his that he considers to be very grave. For instance he has called income inequality one of the greatest sins in the world. He has forcefully condemned people who talk about abortion and say that it is wrong. So it's not as if Pope Francis in general says don't be mean and don't say things that are harsh because he has no problem doing that himself. I strongly recommend you read this article by a faithful Catholic who has tried and tried to the best of his possible ability to listen to Pope Francis and accept what he has to say but find it extraordinarily difficult.